The 2019 Tennessee Home Vegetable Garden Calendar is now available for download. Covering topics like scheduling planting and harvest, area-specific suggestions and crop management, the calendar is a helpful resource for Tennessee home gardeners. Image courtesy UTIA. The calendar includes tips for scheduling planting, harvest and general management. It is formatted like a regular calendar, and you can print and display in a convenient area or use on your computer throughout the year. Also included in the calendar are monthly tasks for growers and an area for taking notes about that month’s weather and crop observations. The calendar is area-specific as well, with suggestions for East, Middle and West Tennessee. The frost/freeze probable dates for twelve Tennessee communities is also included in this year’s calendar. The Tennessee Home Garden Vegetable Calendar is available for download from the UT Extension website, and the final pages of the file include management templates for crops, climate, pests and diseases. The file also includes fillable boxes that enable it to be used as an electronic record keeping system for gardeners who do not wish to print the file. 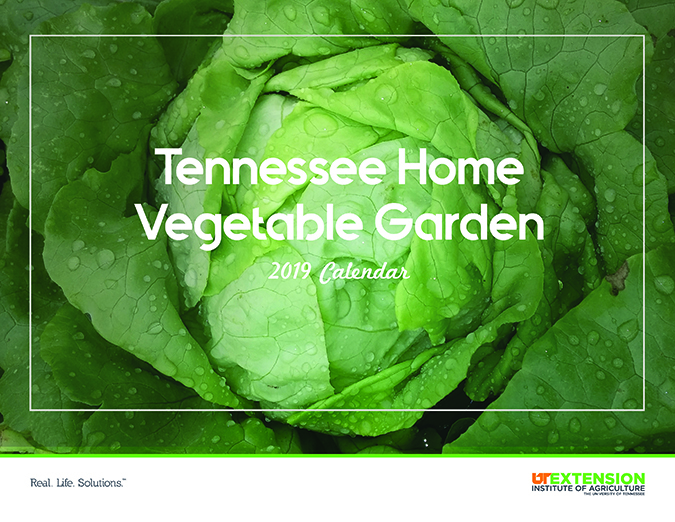 To download your copy of the Tennessee Home Vegetable Garden 2019 Calendar, visit extension.tennessee.edu/publications and type “2019 calendar” into the search bar. Bumgarner also points out the PDF contains links to connect readers to other UT Extension gardening resources, denoted by green text throughout the calendar. For more information about gardening, contact your local county Extension office.